This Week At Sacred Heart Catholic School posts are intended to give a quick run-down of important events and highlight announcements and key information for parents, students, faculty and staff on a weekly basis. Bishop Weisenburger to Celebrate School Mass on February 5, at 10:00 a.m. 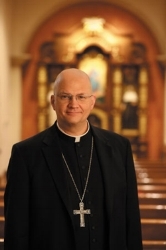 The Most Reverend Bishop Edward J. Weisenburger, the newly installed Bishop of the Roman Catholic Diocese of Tucson, will be celebrating school Mass on Monday, February 5, 2018 at 10:00 a.m. at Sacred Heart Church. All parents are invited to attend this special Mass with the school. Students must wear their full formal uniforms, including ties, to Mass. Additionally, Bishop Weisenburger will be hosting a Meet and Greet on Sunday, February 4, 2018 at 6:30 p.m. in Sheridan Hall. All students, parents, faculty, staff, and parishioners are invited to attend this event and meet Bishop Weisenburger. - After School AZELLA Tutoring (1st - 8th Grades) - 3:00 p.m. - 4:00 p.m.
- Book Club/Title I Tutoring - 3:00 p.m - 4:00 p.m.
- UPDATE: The National Junior Honor Society Induction Ceremony has been changed from Monday, February 5 to Tuesday, February 13, 2018 at 5:30 p.m. in Sheridan Hall. - Early Release at 12:30 p.m.
- Book Club/Title I Tutoring - 3:00 p.m. - 4:00 p.m.
- Student Council Meeting at 1:00 p.m.
Santa Cruz County Superintendent of Schools Alfredo I. Velasquez will be reading to Preschool students on February 12 to celebrate Early Childhood Education Awareness Month. The collection deadline for the Box Tops for Education fundraiser is February 28, 2018. Please regularly visit the website News and Calendar sections or follow the school on Facebook and/or Twitter, for announcements, information, and updates about important activities and events at Sacred Heart Catholic School.